There is an early example of product placement. Look at the windowsill geraniums. They are potted in a Sanka tin! Sanka was a sponsor of The Goldbergs. A documentary was recently released about Gertrude Berg and the show--I saw it advertised at the Regal Cinema website. I'd like to get a copy of the entire series sometime. 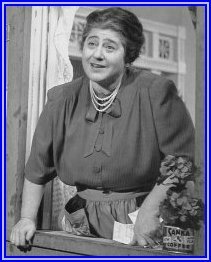 Before Roz Russell was in the movie "A Majority of One", Gertrude Berg played the role on stage. Her TV acting was so good, I'd love to have seen her on stage.